I bought a set of fleece pyjama pants to wear in the hospital when R was born, and they came with an enormous black and white striped shirt. The thing was hideous on me (Horizontal stripes on my pregnant 2X self. Seriously people... why?) but the fabric was a super snuggly soft 1X1 rib in 100% cotton, so I kept it around, just in case. When I read that really young babies have trouble distinguishing anything other than very high colour contrast, and hence love graphic black and white toys, I knew my convict-esque shirt had a future. I set out to make a simple cuddly sphere for her to drool all over. She loves it so much I thought I'd share. First, cut a piece of cardboard into a 25.5 x 8.5 cm rectangle (the short end is exactly one third the length of the long side) to use as the pattern. Using this as a guide, cut 2 pieces of t-shirt on the bias. I think if your fabric is a stocking stitch knit rather than a rib you could cut on grain, but a rib stretches too unevenly to cut on the grain for this project. Try it if you like (I did, with unspectacular results) but I think you'll have better luck on the bias. Using the short end of your cardboard pattern, measure one third of the way along the long side of one of your fabric rectangles. Position the short side of the other piece along this long side, covering the middle third of the piece and making a T shape. Pin. Wow... that makes no sense. Look at the picture OK? 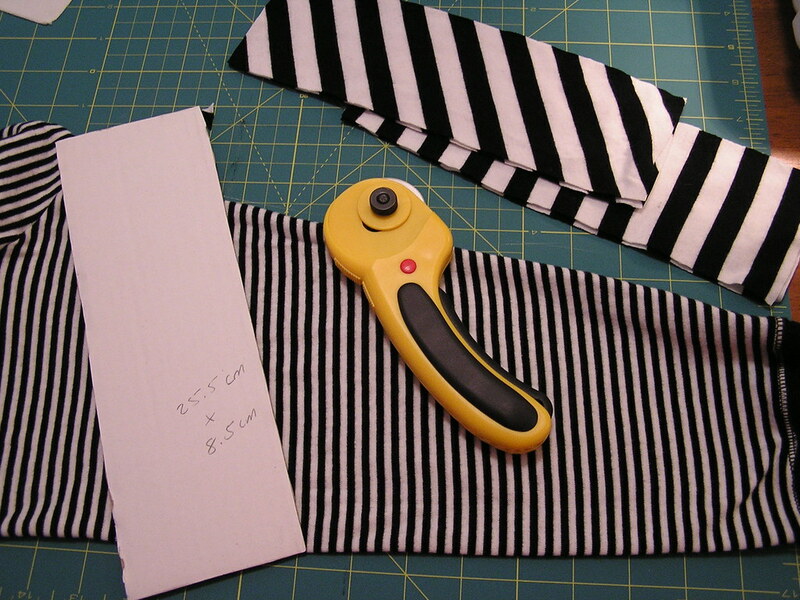 Sew along that pinned edgeuntil just before you reach the end of the short side of the top piece of fabric. 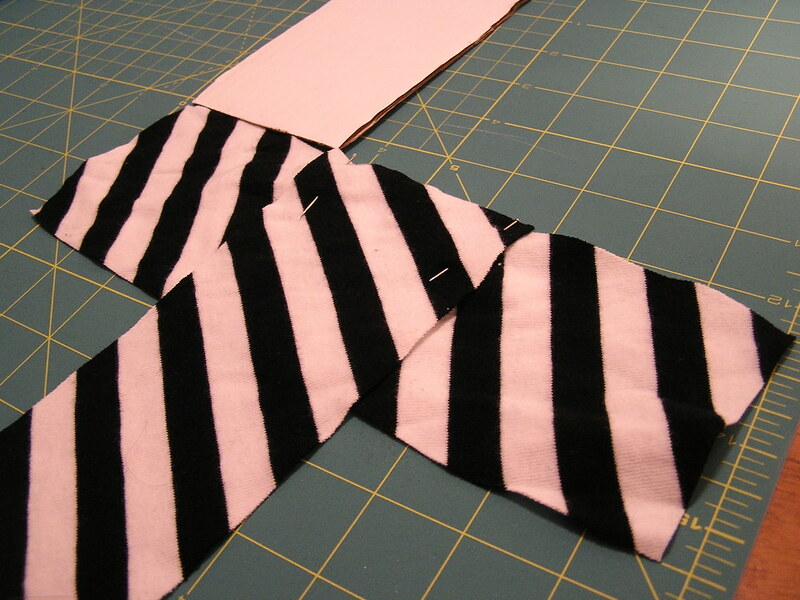 Re-align the edges of the 2 pieces, and continue sewing around, matching up the edges in thirds as you go. Essentially you are making a cube - each rectangle makes up 3 sides. Leave a smallish hole at the end of your seam. Turn, and stuff. R loves this thing. It's really squashy so she has been able to grab onto it with her clumsy little mitts ever since she first began to show interest in holding onto her toys. Mostly now she tries to shove it in her mouth, which is pretty fun to watch as it's almost as big as her head. 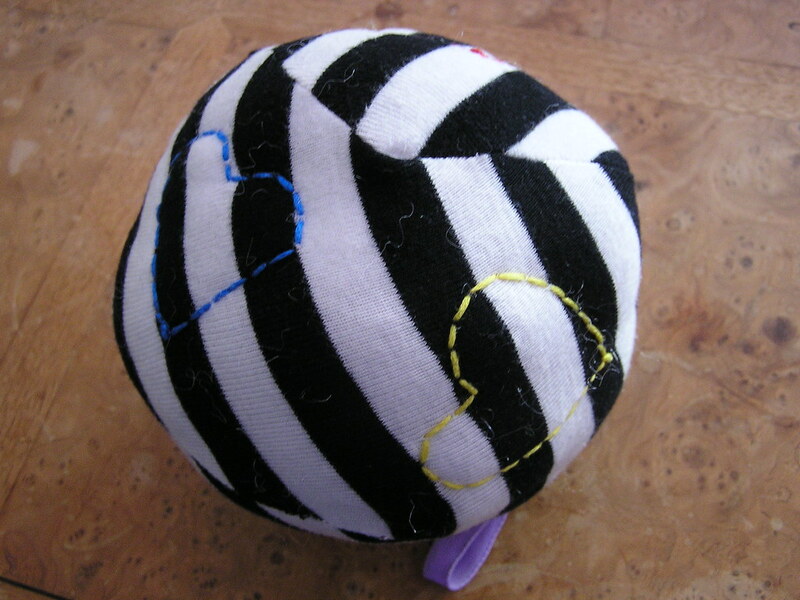 I think this fabric ball is a great, versatile toy because it can be simply modified with greatly varying results, and doesn't take as much sewing as a 6 piece stuffed cube/ball/thing. 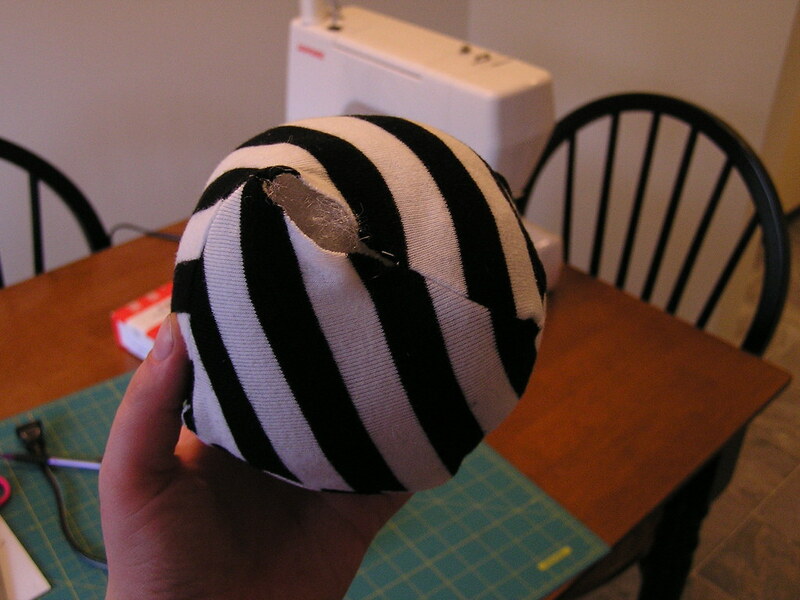 Make it in a non-stretchy fabric for a more cube shaped toy, or stuff it with a cube of foam instead of polyfill if you want something that would work like a building block. Throw a few jingle bells or some crinkled up cellophane inside so it makes sounds when baby plays with it. Use different textured fabrics like corduroy or vinyl, or sew tabs of ribbon in all the seams to give it tactile interest. Put a securely sewn sachet of dried lavender inside to stimulate baby's sense of smell. Have fun with it and baby will too!